474 pages | 86 Color Illus. | 278 B/W Illus. Biodiversity loss in terrestrial environments associated with human activities has been appreciated as a major issue for some years now. What is less well documented is the effect of such activities, including climate change, on marine biodiversity. This pioneering book is the first to address this important but neglected topic, which is likely to be the key challenge for marine scientists in the near future. Using a multidisciplinary and a holistic approach, the book reveals how climatic variability controls biodiversity at time scales ranging from synoptic meteorological events to millions of years and at spatial scales ranging from local sites to the whole ocean. It shows how global change, including anthropogenic climate change, ocean acidification and more direct human influences such as exploitation, pollution and eutrophication may alter biodiversity, ecosystem functioning and regulating and provisioning services. The author proposes a theory termed the 'macroecological theory on the arrangement of life', which explains how biodiversity is organized and how it responds to climatic variability and anthropogenic climate change. The book concludes with recommendations for further research and theoretical development to identify oceanic areas in need of observation and gaps in current scientific knowledge. Many references and comparisons with the terrestrial realm are included in all chapters to better understand the universality of the relationships between biodiversity, climate and the environment. The book will serve as a textbook for all students and researchers of marine science and environmental change, but will also be accessible to the more general reader. "This is no ordinary textbook. The author presents clear, historically informed material on a huge range of relevant topics in climate science, physical and biological oceanography, ecology (terrestrial as well as marine) and of course biodiversity. There are excellent introductions to existing classifications of observed spatial and temporal variation in biodiversity and to the competing hypotheses to account for them. We urgently need unifying theories of marine biodiversity and he sets out a candidate theory together with a call for the global monitoring needed to test such theories and to track and predict changes. I warmly recommend this book not only as the first major volume on marine biodiversity, but as an outstanding introduction to marine ecology and climate change. It is well written and provocative, but in the best sense of clarifying issues and presenting differing views." – Keith Brander, Johan Hjort Professor Emeritus, Danish Institute of Aquatic Resources, Technical University of Denmark. "With Marine Biodiversity, Climatic Variability, and Global Change, Grégory Beaugrand joins the select club of scholars who have written a major textbook, i.e. a work that develops an original idea in great depth, based on a broad knowledge of the primary literature. Several textbooks have decisively influenced the development of scientific disciplines. Examples are, among others, Perspectives in Ecological Theory (Margalef), Dynamics of Marine Ecosystems (Mann & Lazier), and Ecological Geography of the Sea (Longhurst). It is likely that, in years and decades to come, graduate students and researchers will refer to Beaugrand’s textbook as the seminal work in the field of marine biodiversity, as they refer to our own Ecologie Numérique and Numerical Ecology when they ground their studies in numerical ecology." – Louis Legendre, Sorbonne Universités UPMC Paris 6, Villefranche Oceanography Laboratory, France. "One of the most important, appealing, and enduring 'big ideas' in oceanography has been that global patterns of oceanic biology productivity and composition are driven by and predictable from patterns of ocean climate and seasonality. Data and theory on this topic have produced hundreds of good journal papers and book chapters, and several remarkable books. Grégory Beaugrand extends the tradition with his new book Marine Biodiversity, Climatic Variability, and Global Change. The book begins with an overview comparison of biodiversity between differing taxonomic levels and between terrestrial, marine pelagic, and marine benthic environments. It then reviews (Part 1) "natural" spatial and temporal patterns of climate and biodiversity, and how these have changed over geologic time scales. This is followed (Part 2) by an important and timely forecast of how (very rapid) anthropogenic alterations of climate and ocean chemistry are likely to alter marine biogeographic patterns, and (Part 3) by a potentially unifying theory, and needs for long-term monitoring of the physical and biological ocean. The book is wide-ranging, and will earn its place in institutional and personal libraries in several ways. For example, Part 1 is a good cross-disciplinary introduction to topics such as the global heat engine, modes of physical climate variability, biogeography, and biodiversity theory. Part 2 provides more detailed review and synthesis of how various marine populations and communities have responded to recent climate variability (and to other modes of anthropogenic environmental change), and how changing biodiversity might affect ecosystem resilience and human well-being. Part 3 (the shortest but my favorite) makes the case for a new theoretical paradigm based on the ecological niche, and predicts how climate change will alter projections of species niches onto the earth’s surface and within the annual seasonal cycle." – Dave Mackas, Senior Researcher, Institute of Ocean Sciences, Canada. 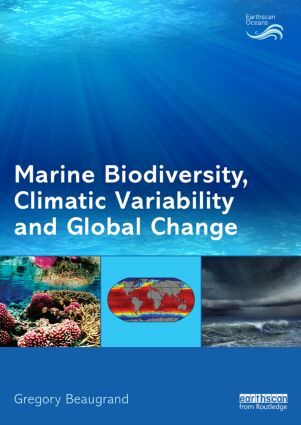 "This is a very special book on a number of fronts that summarises for the reader a vast array of information on marine biodiversity and the world we live in, reinforced by a large bibliography. Grégory Beaugrand takes us on a journey through time and space documenting in a systematic way the regulation, laws and theories behind the patterns of marine biodiversity seen today and in the geological past. He rounds off the book by proposing a new macroecological theory to explain patterns of biodiversity and their interaction with climate and environmental change. "Beautifully illustrated with drawings and graphs of an exceptional quality, and liberally with superb coloured maps and plates, the book has an immediate appeal. Both the text and illustrations are well balanced reflecting the care and thought that has gone into the composition as almost all are drawn, redrawn or simplified by the author. Perhaps its greatest recommendation is the book’s readability. Even complex mathematical and statistical relationships are presented in a way that is understandable and accessible to a wide readership while at the same time giving the necessary foundation for an expert in the topic. If anyone is in any doubt about the huge impact humankind is having on the oceans and world at present they should read this book. Referencing Beaugrand’s first sentence – Aristotle would have approved – as this book is truly interdisciplinary, the work of a talented polymath." – Philip (Chris) Reid, Professor of Oceanography, Marine Institute, University of Plymouth; Senior Research Fellow, Sir Alister Hardy Foundation for Ocean Science; and Honorary Fellow, Marine Biological Association of the UK. Grégory Beaugrand is a research scientist at the National Centre for Scientific Research (CNRS), currently based at the Laboratory of Oceanography and Geosciences in Wimereux, France. He is a research associate at the Sir Alister Hardy Foundation for Ocean Science (Plymouth, UK) and a former member of the French National Committee for Scientific Research (Earth System Science).